In the ebbs and flows of design trends, there’s often a component that relates to location. You’ll sometimes here a brand proclaim they are refining their design strategy to pursue a global audience. Other times its a realization that a brand has lost its way and localizes design to get back to its roots. The difficult to find balance point is local enough to have personality without being too specific to the point few others can relate. Apple and lately Ford are very much on the side of globally driven design. While Levi’s and Volvo are injecting localized design into their apparel and vehicles reflecting American and Scandinavian culture respectively. Mazda is at a similar crossroads. At the 2017 Tokyo Motor Show, they debuted two concept cars that aim to show the brand is moving up to a near premium level. Mazda invited us to spend some time in Tokyo and visit their headquarters in Hiroshima to get a preview of their plans and experience some time immersed in Japanese culture. 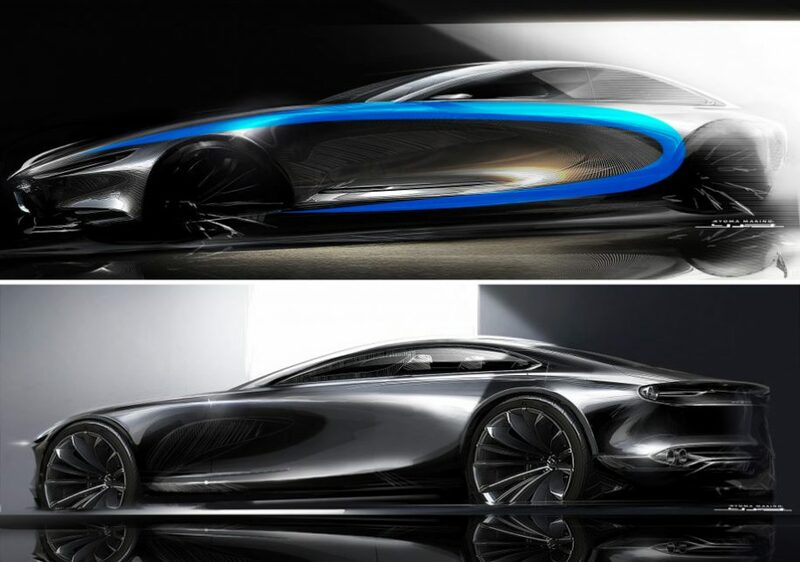 Much of what they talked about related to their design strategy known as Kodo design. It is already playing a big role within the company and Mazda wants to grow it to become synonymous with Japan. What might Mazda be hoping to achieve with design having a closer connection to Japanese culture? Scandinavian design is know for simplicity, German for precision and Italian for emotion, traits that reflect cultural elements. A baseline for Japanese design is a bit trickier to pin down. One period with some potential clues is the golden age of Japanese electronics in the 70’s and 80’s. 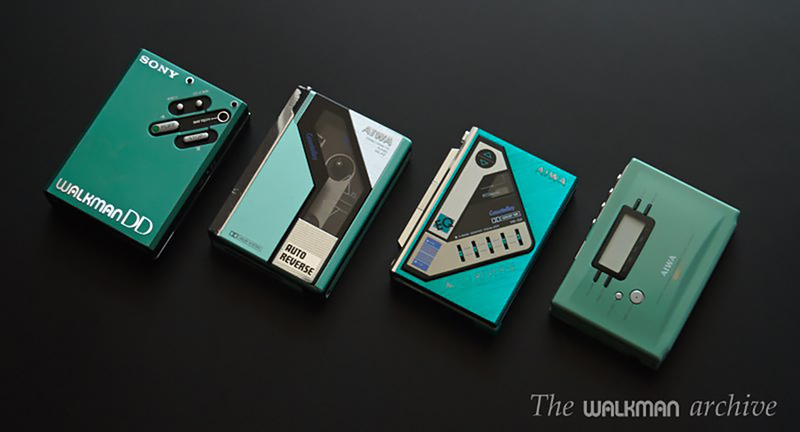 This was a time when Japan dominated the personal electronics market, led by Sony. They broke free from largely copying designs from America and Germany in the 60’s to create an aesthetic that blended modern shapes with finely composed graphics. These were some of the first personal electronics that bridged to become fashion accessories. The elegant simplicity is what makes some of these products still look fresh today. To us, a car is more than just a means of transport or a mass of metal. It should be a vital presence in people’s lives, like a friend or family member. That’s why the Kodo design philosophy is all about breathing life into the very form of the car. Mazda has captured the energy found in the frame-by-frame dynamism of living creatures as they move, and infused this energy and rhythm into the form of our vehicles, creating cars with a vitality that makes them truly alive. The Mazda look is not “Japonism” in a simple sense; rather, it is about reinterpreting the very essence flowing from the fundamental elements of Japanese aesthetics, and expressing this as “a new kind of elegance”. Probably a sound interpretation of the aesthetics of Kodo is dynamism balanced by subtlety resulting in elegance. Or a quiet Shinto shrine in the midst of Tokyo skyscrapers achieving harmony as a place. A very localized analogy but that seems to be the intention. The description above of Kodo uses terms that have inherently artistic qualities. And that is where their design process starts. 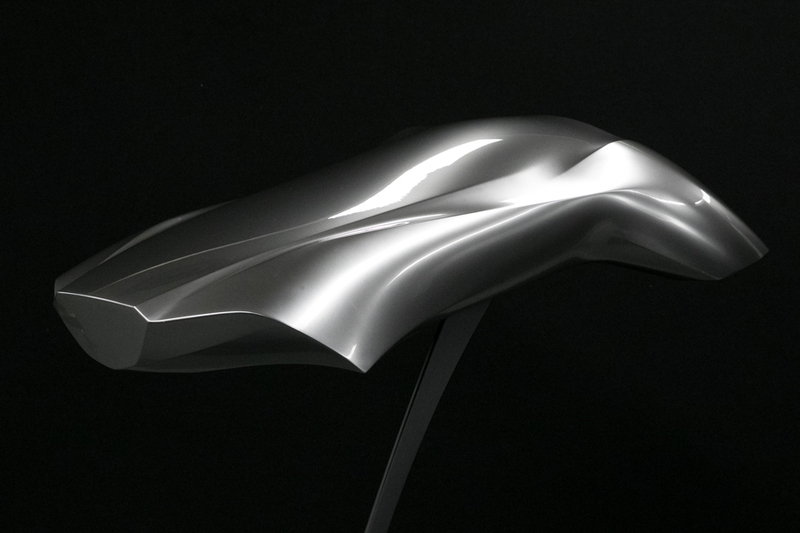 Both Mazda designers and sculptors are encouraged to explore form generation in abstract ways. 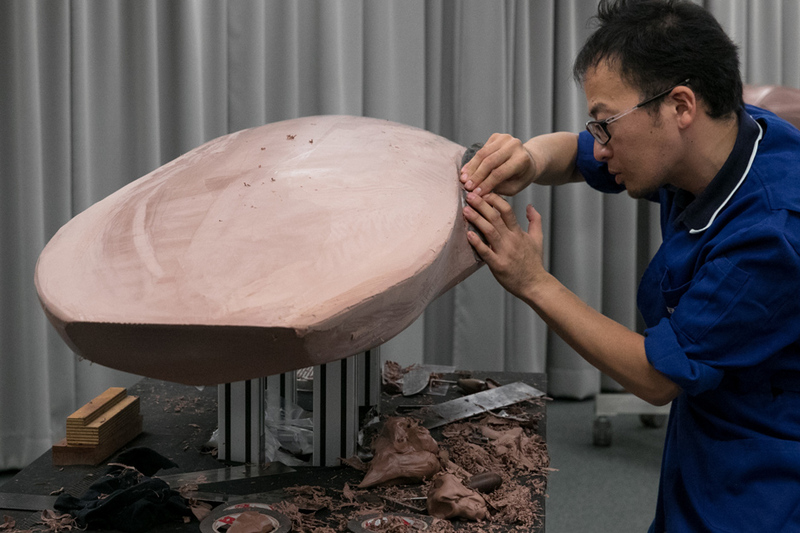 For the sculptors, they free sculpt speed forms that are used as inspiration for developing the look of a specific vehicle. This is a very tactile, almost fine art approach that taps the sculptors craftsmanship abilities. Kodo extends beyond design to engineering and manufacturing within Mazda. As design are refined, engineering teams are brought in to get introduced to the design work and start to problem solve how it will get built. There’s a working partnership between design and engineering to keep the transition to production as seamless as possible. This even extends to manufacturing where we heard technicians in the tool and die plant refer to a machining process as Kodo polishing. In this area, where the stamping dies are made that create body panels, the finishing work is still done by hand. The craftsman who work there hone their skills over the course of years, and while they work in metal, aren’t that far removed from the sculptors who use clay. This all results with the two the concept cars, the Vision Coupe and the Kai debuted at the 2017 Tokyo Motor Show. The Vision Coupe Concept offers a broader look at where Mazda hopes to take the brand so we’ll analyze that one in more detail. The biggest design gesture happens on the side of the car where the designers wanted to create a surface that moved around the bodyside. You can see this highlighted in blue. Within this highlight is a reflection that tapers from front to back mimicking the thinner front legs and more powerful back legs of an animal in motion. Mazda is keen to distance themselves from other Japanese marques using a simpler shapes. Where other brands are excessively sculpting and tacking more pieces on, Mazda is striving for a cleaner look which they feel presents a more premium image. 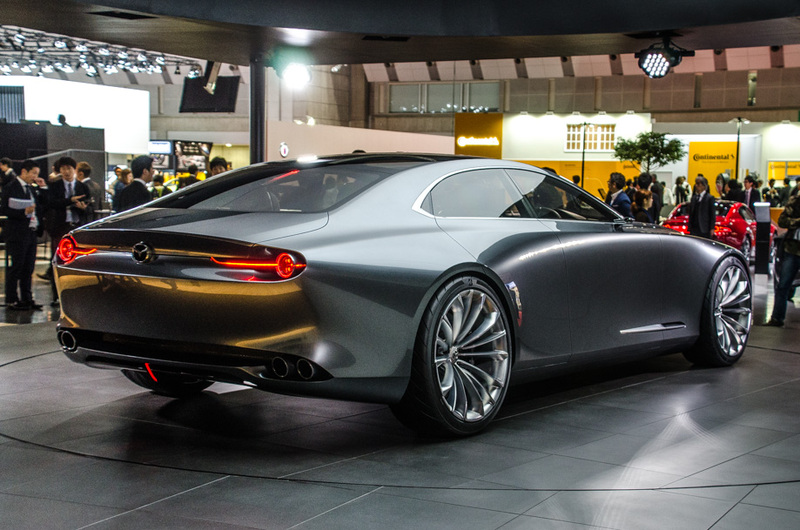 The back of the Vision Coupe shows a high level of detail refinement for the brand. 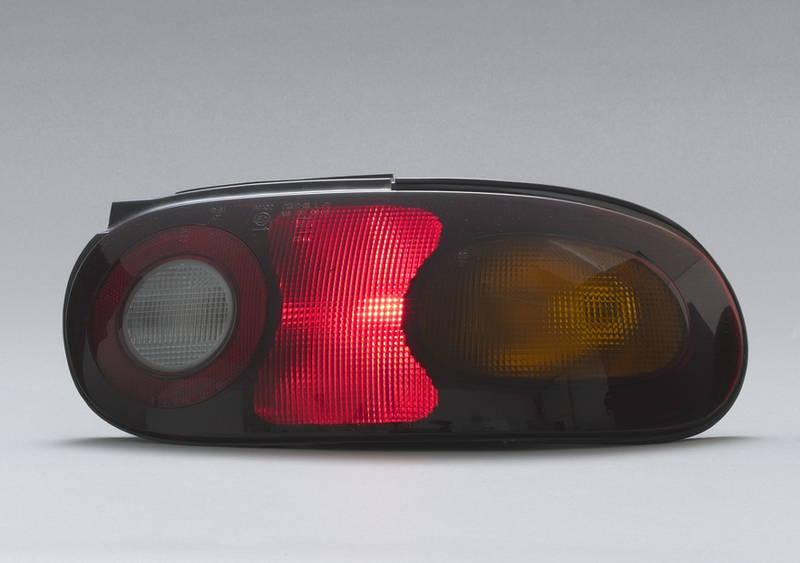 Taillights are something Mazda have expertise in, the original Miata taillights are part of MoMA’s permanent collection. On the Vision Coupe you can see the circular shape used again that links back to the original Miata design, long before Kodo was a plan. 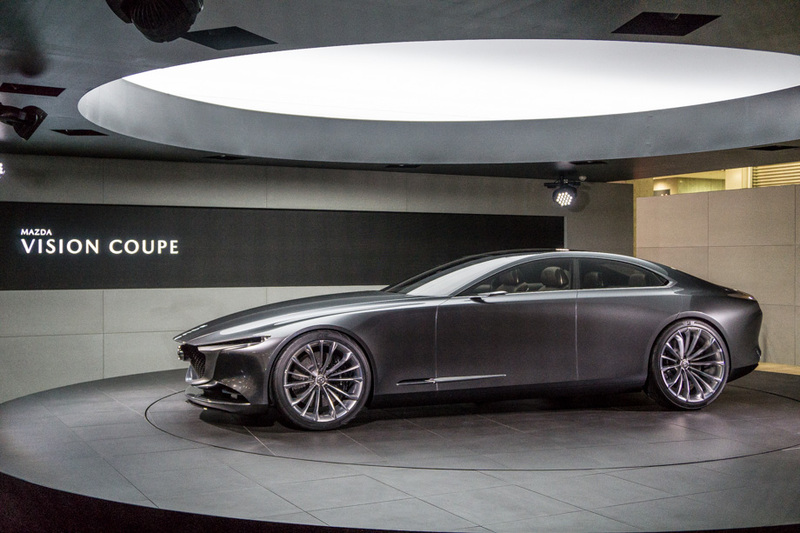 The front of the Vision Coupe is, well rather traditional. There is still a large grille and the headlights and air vents aren’t unlike anything we’ve seen before. 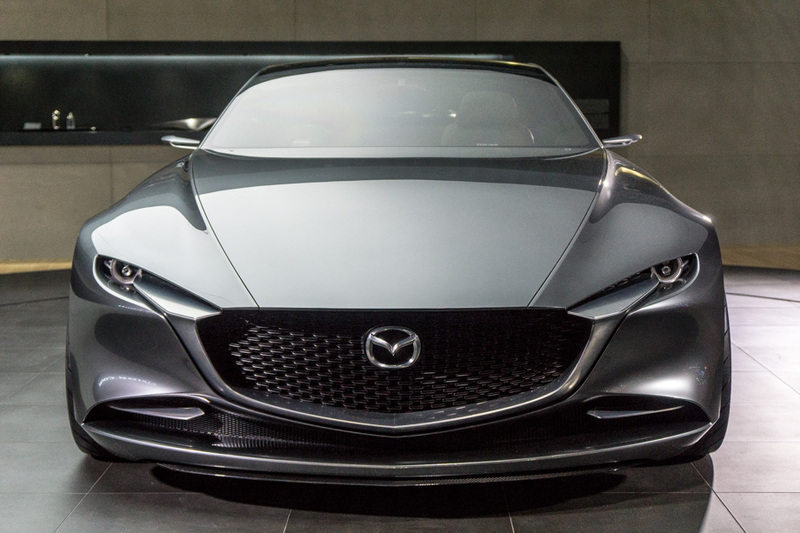 The front feels more like an evolution of what Mazda is already doing versus a test of something radically different. The Vision Coupe is still essentially a very evolved version of a speed form. There’s a lot on this concept that would be tough to mass produce. The way the hood extends beyond the from of the car for example would’t fare well in a crash. So there’s less practical evaluation involved here and more critique on it as a sculpture. And as for that it is appealing to the eye but not totally memorable. That leads into a summary of Mazda’s Kodo strategy in general. The narrative is filled with lots of descriptors that reference shape and form and sensations. These are all very common terms that designers share when talking about what they are doing with other designers. It becomes more difficult to use this as a brand narrative because it is so abstract. Cars obviously need to function and purchasing decisions are made based off those beliefs. Kodo has the artistic side of the brand well defined, the practical side, that’s a grey area right now. If Mazda’s goal is to become more premium and distinctively Japanese, they need people to believe that their products are both elegant and worth the extra cost because they perform better, or are more comfortable or have the best technology. There’s a rational part of the story that can’t go untold and should be intertwined in a way people see benefits.